As competition for internationally mobile students continues to intensify, greater attention is being given to the relative costs of living across both established and emerging study destinations. The latest comparison comes from an annual survey by Student.com. It highlights current living costs in destinations around the world, and, in keeping with other recent-year tracking studies, finds that some of the largest cities in the US and UK remain among the most expensive. The survey results for Cities in Focus: 2018 Global Student Accommodation Indicator are derived from a representative sample of more than 12,000 students who booked accommodation via Student.com between 1 November 2016 and 31 October 2017. In contrast to earlier reports from the online booking service, this year’s study casts a wider net to cover 125 cities worldwide in destinations including the US, UK, Canada, Germany, Spain, France, Ireland, South Africa, Singapore, and Australia. The report finds that average weekly spend on rent in 2017 was US$214, a value that is actually slightly lower than the average recorded for 2016. The small dip in this year’s global benchmark is not likely any indication of a decrease in housing costs as such, but more that the 2018 survey includes a wider field of destinations, including some that more affordable. That said, a year-to-year comparison of rental costs for major city destinations – including New York, Boston, and London – suggests that prices have been relatively stable between 2016 and 2017, and even that students are finding slightly more affordable options in some cases. 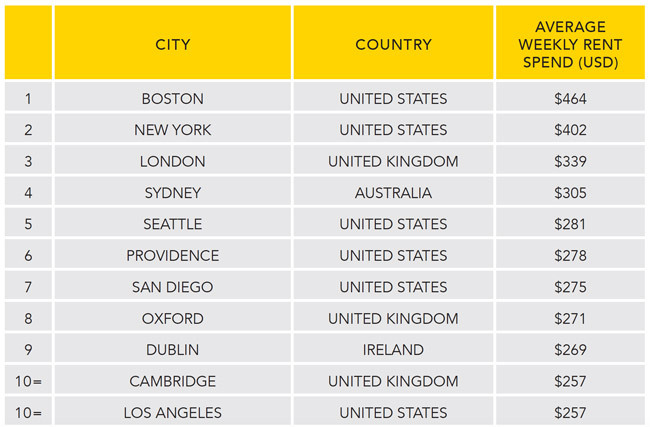 Boston takes over the number one spot as the most expensive city this year, with New York, London, Sydney, and Seattle rounding out the top five. As the following table reflects, weekly rents in each of those destinations range from roughly US$300 and above. In terms of comparisons by country, the study notes Australia as the most expensive study destination with weekly rentals averaging 19% above the global benchmark, or about US$255 per week for the average Australian-bound student. This compares to the US and UK which were both below the worldwide benchmark at US$204 per week and US$212 per week respectively. In contrast, destinations in Spain, South Africa, Singapore, and smaller cities in the US (such as Tallahassee, Florida and Athens, Georgia) ranked among the least expensive options in the 2017 sample. Rentals at this end of the table averaged anywhere from well below to just over US$100 per week. This entry was posted in Africa, Asia, Australia/Oceania, Europe, Middle East, Most Popular, North America, Regions, Research, South & Central America and tagged international students, education abroad, Most Popular, student enrolment, student recruitment. and for a side note, 4 of the LOWEST cost of living are in Tennessee, I live in Cookeville, home of Tennessee Tech University and its so affordable most of our students transfer to TTU cause which the savings on the cost of living, they can afford to go on to graduate school.